The ultimate New Zealand itineary for outdoor fans! Welcome to the first part of our Ultimate New Zealand Itinerary for Outdoor Fans! A couple of years ago we were in the lucky position to spend six weeks traveling in New Zealand and since we are 100% outdoor lovers, we spent them the active way. Most of our time we went hiking, but we also added some (mountain) biking, kayaking and other outdoor cool activities to our itinerary. Ever since, we received many questions from readers about the trails we hiked, which are the must-do’s in each place and so on. So I figured I’d combine all tips and tricks into one series of posts which makes planning your ultimate New Zealand trip even easier! Even though we traveled for six weeks, we realize not everybody will have that amount of time available. There for, we will give you suggestions on what to skip if you have less time but also what to add if you have some extra time at the end of this blog. Apart from our six week trip, we also went backpacking through all of New Zealand back in 2002, so don’t worry, all suggestions are carefully chosen by us from our own experiences and not randomly picked from a guidebook. The first thing we did on the morning of day four, was pick up our rental car. Although we would be leaving it behind for quite some time during our multi-day treks, we still decided to go for a rental since we wanted to go to places the regular buses don’t go to. We rented a Travella from Jucy which seemed the best option as we didn’t feel like spending too much, but we still wanted some decent leg space and the possibility to put all our luggage out of sight when hiking. Upon arrival at their downtown rental station, it turned out that our car wasn’t there yet, however they borrowed us another one so we could at least go and do some groceries. In addition they waived our fee for the second driver so we didn’t really mind waiting for a bit. On day five we planned to go mountainbiking the 42 Traverse but the weather wasn’t very good and the guy who would take us up to the trailhead, advised us to do some other trail instead. So while I decided to stay at the campsite catching up on sleep (hello jetlag! ), Martijn biked a part of the Fishers Track instead. In addition, we did some short hikes near Whakapapa Village to various waterfalls. Our pick for National Park Village was to stay at National Park Backpackers. They have a large variety of rooms however we camped on their small campsite. We were still allowed to use all their indoor facilities as well as their indoor climbing wall. 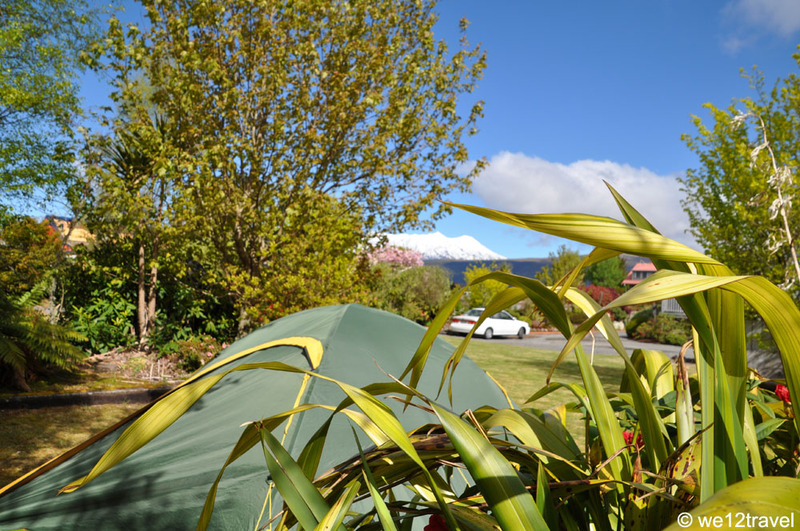 The views from the campsite are simply stunning, if it’s a clear day, you will be in a million dollar position! 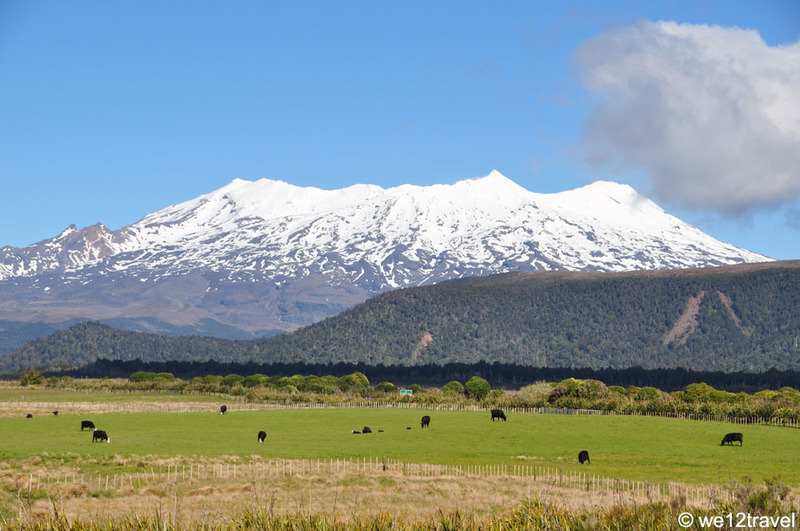 For further reading about Tongariro National Park and our suggestions – check out our Park Post with lots of tips for additional planning on what to do and where to go! We met many travelers who had been looking forward to the Tongariro Alpine Crossing forever (which is justified, it’s one of the most amazing trails in New Zealand) but even though the skies were clear, it turned out that there was too much wind and it would be too dangerous. We saw quite a bit of disappointed people who hoped they could do the trek on their day off but were unable to stay for another day as they had further arrangements. The weather made it necessary for us to reverse our trek on the Tongariro Northern Circuit. Luckily it was still pretty early in the season so there was plenty of availability at the huts and it could easily be arranged at the DOC Center in Whakapapa Village. 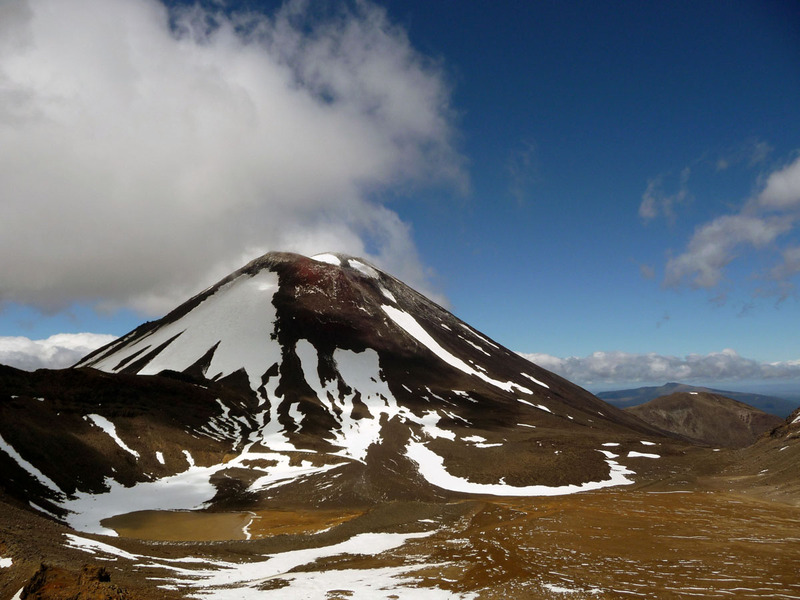 Until now, the Tongariro Northern Circuit is still one of our favorite multi-day treks ever. 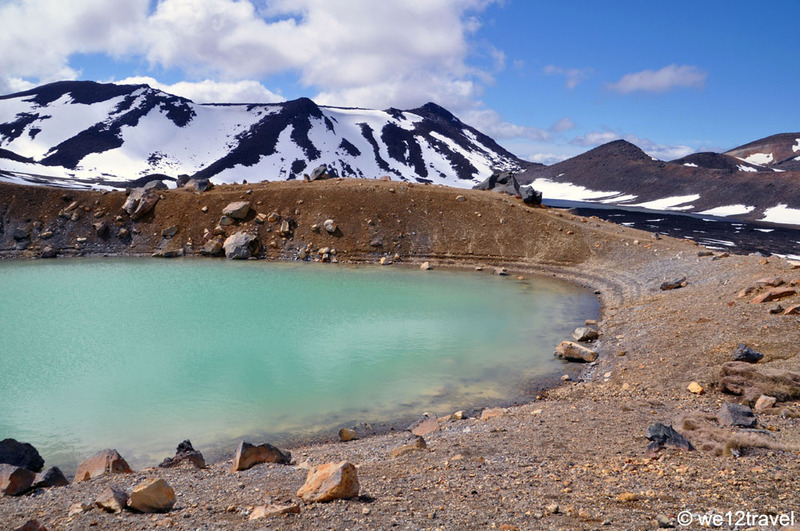 The famous Tongariro Crossing is a part of it, but the other parts of the trek are well worth your time as well. Some other highlights of the trail included the Lower Tama Lakes and waking up in the Ketetahi Hut with a fresh layer of snow all around us. Another good thing about being on the multi-day track is that you can be on the trail much earlier than the crowds on the dayhike, which actually makes it possible to take pictures without other people in it. For more inspiration, check out our blog about hiking the Tongariro Northern Circuit including a full day-to-day description about this magnificent hike! Well … in the huts on the circuit. The first night, we were at Waihohonu Hut, the second night at Ketetahi Hut and third night at Mangatepopo Hut, however this is reversed from the most regular way. You can book your stays at the DOC website, reservations for the huts are required if you are hiking between mid October – end of April. After finishing the Tongariro Northern Circuit we make our way down to the southern part of the Northern Island. Instead of driving the regular route down to Wellington, we take a small detour over the Desert Road, which is super awesome, however it can be closed in severe conditions. We planned to stay in Otaki to visit the Icebreaker outlets which we heard great stories about, but we find them quite disappointing. Although they have a big selection, it’s not much cheaper than outlet prices back home. I’m sure Otaki is really nice when the weather is good, we got chilly weather and fierce winds instead. It was the same the next day when driving down to Wellington and taking the ferry to the Southern Island. However, upon arrival “down south” it seemed that we were back in the game: blue skies and sunshine! We spent the night in Picton before embarking on our next adventure: a three-day active tour on the Queen Charlotte Track. In Otaki we camped at Bryon’s Resort. Not typically our first choice because it’s pretty large, but we were in desperate need of a hot shower and they offered good laundry facilities. In Picton we booked a room at the Sequoia Lodge, a great facility for backpackers and active travelers. Their free chocolate pudding and ice cream nights are a definite bonus! Instead of hiking the Queen Charlotte Track for three days, we decided it would be fun to book a hike-bike-kayak combo. 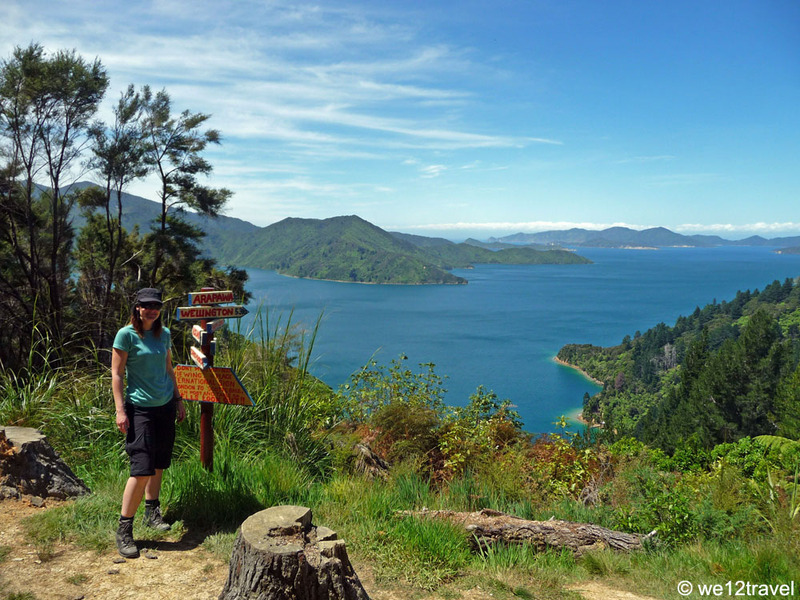 We searched online for packages and eventually booked with the Marlborough Sounds Adventure Co, as they offered us a full package at a good price. On day one we boarded a watertaxi from Picton to Punga Cove, from where we hiked to Cowshed Bay. It was quite a sturdy hike, no less than 24.5 kms, but our camping gear was being dropped off at the campsite near Cowshed Bay for us so that helped. 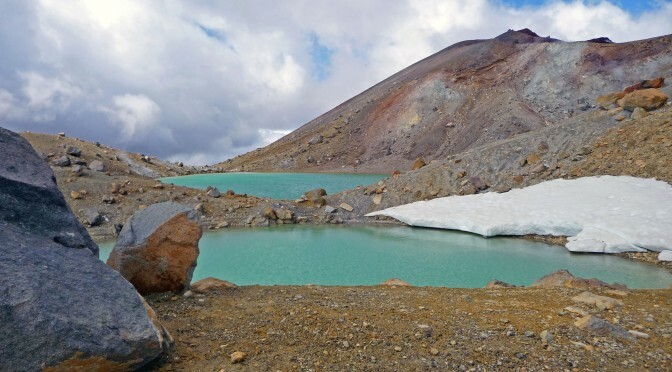 The hike was simply stunning and fairly easy compared to Tongariro so in case you want to try a relatively easy multi-day trek, this is the one for you! The next day we were supposed to go seakayaking but … the weather was just horrible. The wind was blowing like crazy and our guide told us that we would end up in the water all the time. So we decided there would not be much fun in it and canceled the kayaking and went mountainbiking instead. 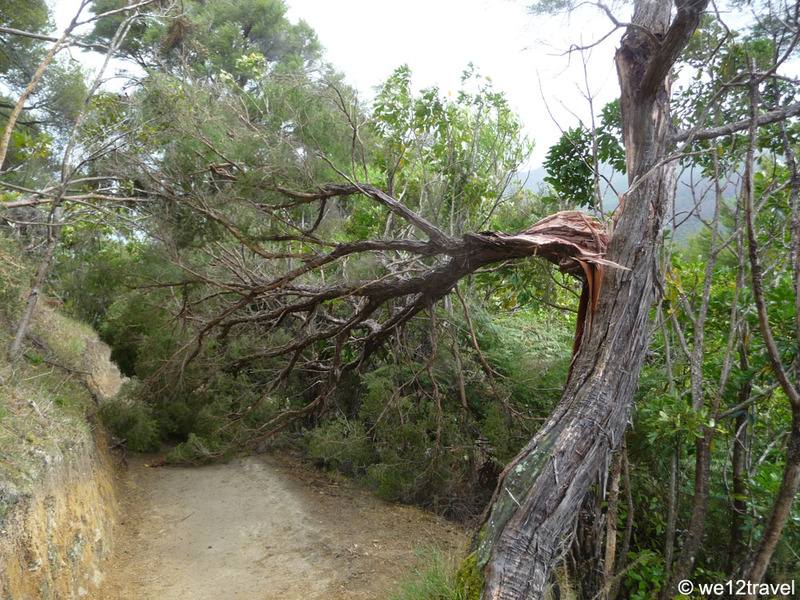 However, because of the severe winds, the trail was blocked by lots of trees that had come down. After an hour I had enough and decided to head back to the campsite on the paved road while Martijn pushed onwards a bit further (it’s obvious who’s the real mountainbiker here by now I guess). On the morning of day three we caught an early watertaxi back to Picton, where we spent the rest of the afternoon relaxing back at Sequoia Lodge. While on the Queen Charlotte Track we stayed at Cowshed Bay Campsite. This campsite can also be reached by road which was a little disappointing as we expected to be a bit more remote, however the location was just gorgeous. Unfortunately up until now we haven’t done any additional writing about our time at the Queen Charlottes, however most information you will need to plan your trip can be found at the DOC website of the Queen Charlotte Track. – Add Taupo which is a great place for skydiving. We’ve also been to Rotorua but we found that a little disappointing, maybe also because we’ve seen so many geysers in other parts of the world, too. If you’ve never thermal activities before, consider going though! – Visit Waitomo and their amazing glowworm caves. You can do some pretty cool black water rafting there and the caves are a must-do. – If you are more of a city person, definitely make Wellington a priority, it turned out to be one of our favorite cities in New Zealand. The Te Papa Museum is simply stunning and keeps you busy for at least a couple of hours. – The Bay of Plenty is gorgeous and a great place to stay for a couple of days on your way down south. Unfortunately we only got to see this for a couple of hours but we could definitely have imagined staying here for a longer period of time. 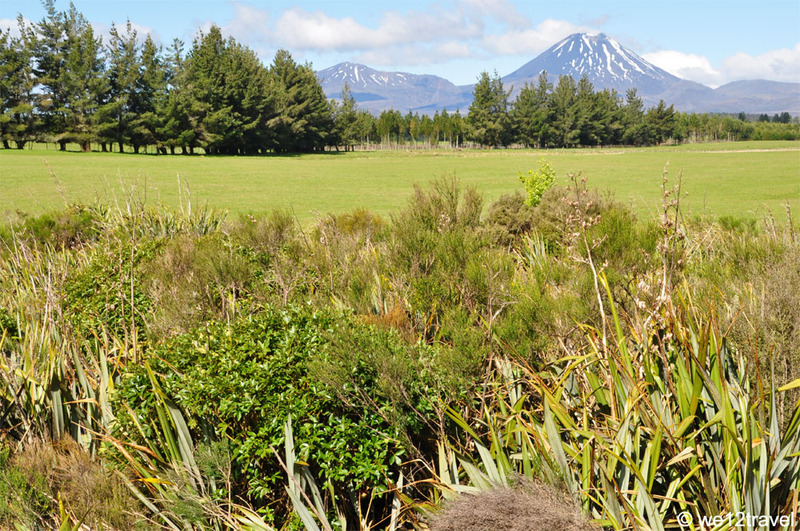 – Skip the free day in Tongariro we used for mountainbiking or do the Tongariro Crossing instead of the Northern Circuit. 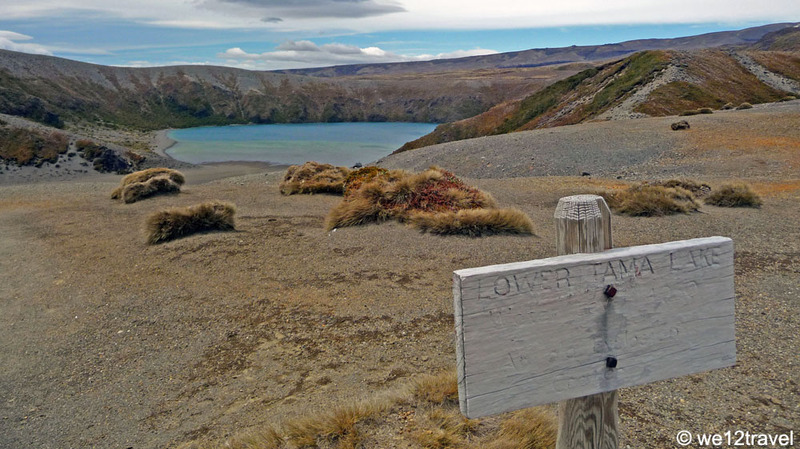 You can still take a dayhike to Lower Tama Lakes for example, if you have two days off in Tongariro National Park. 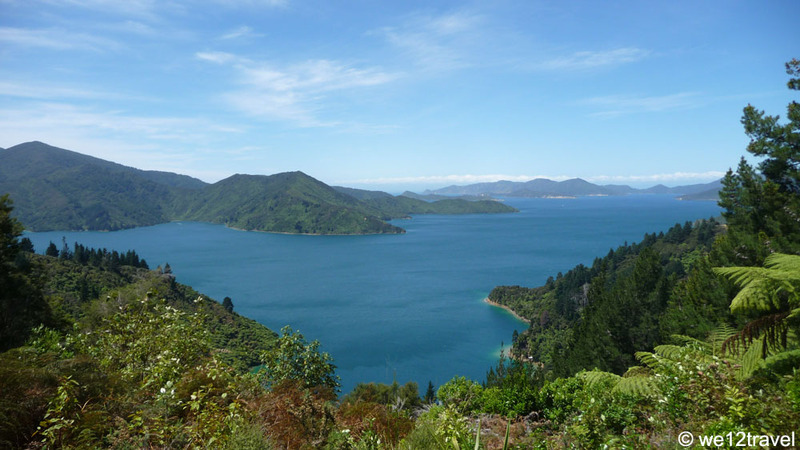 – Take just a one day trip on the Queen Charlotte Track, either kayaking, hiking or mountainbiking. We hope you enjoyed the first part of our ultimate New Zealand Itinerary for Outdoor Fans. From here, we’ll slowly continue our way down south along the spectacular west coast. Stay tuned! Did you ever visit New Zealand and did you any of the treks we mentioned above? Glacier Hike on Sólheimajökull – a must do in Iceland! Some fab ideas here, definitely a country I need to visit before too long. Love the hike-bike-kayak idea at Queen Charlotte, we love outdoorsy stuff but have never combined them like this (though I’m only go at downhill bits on the bike!!). Gorgeous pics too! New Zealand seems a different world on its own! Truly majestic! yeah it is … so much different than the rest of the world! As you know I’m not as much into outdoors as you’re but when I go to New Zealand I’d love to spend the majority of my time outside of the cities. And this sounds like a perfect plan for that! I really hope I will go there one day as all these places sound just incredible! I’m sure you’d love it. The NZ cities are great too and there’s quite a bit of Maori culture as well so I’m sure you’d love it! Did you really do all that in 2 weeks? Amazing! New Zealand is probably the number 1 place I am bummed we didn’t get to who;e in the area. I suppose its never too late though. The scenery and that hobbit village is just stunning! Thanks for sharing your adventure and amazing pics! Yeah – we are super active! I hope you will get to make it one day, it’s an amazing place! It’s an amazing and diverse country. I’d definitely add for anyone spending a day or two in Auckland to get out on the Hauraki Gulf and visit at least one of the offshore islands. 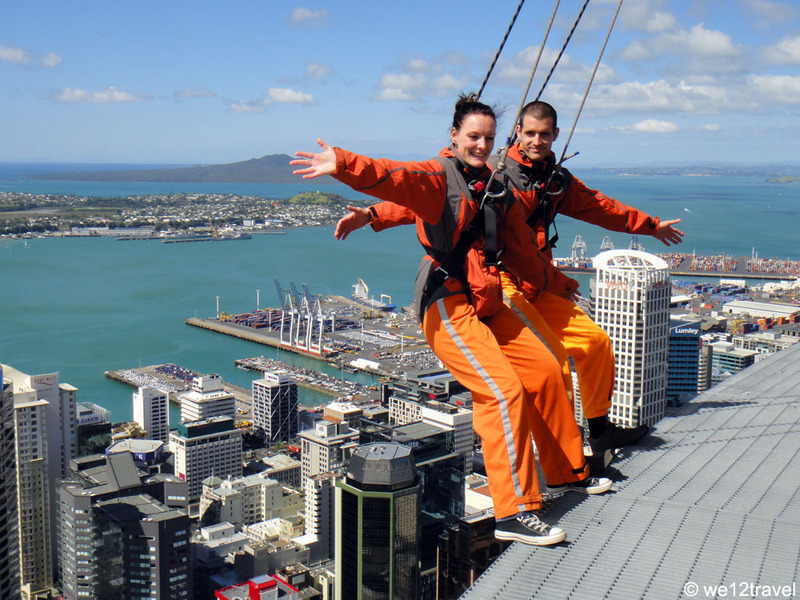 Auckland is also built on an ancient volcanic field and 50+ of the cones remain, climbing one or two of those for their incredible views of the city is definitely worth doing. You’re so right Toni and thanks for the add ons! Unfortunately we’ve never really taken the time to explore the volcanoes around Auckland although I’d love to. Neither have we been to Bay of Islands, which is supposed to be stunning. Still soooo much left to see there! I love this roundup! I’ll definitely be taking notes especially since everything seems to be right up my alley! I don’t even know how you narrowed that down to the list here, I wouldn’t have been able too. New Zealand is incredible! Great itinerary! Haha – took quite a while though. NZ is incredible indeed, can’t wait to go back again! Stunning photos! How cold does it get at night for the camping? Depends on where you are and what time. In Tongariro it still snowed but by the end of December we reached the Southern Island and it was pretty hut and humid during the day so it never got very cold during the night! This brings me back a few years. New Zealand is such an fascinating and varied country. I definetly will have to do some of the things you mentioned the next time I am there. Have fun on your next New Zealand trip then! It’s clear a lot of thought went into your list, and although it’s probably not the “ultimate” because it has been a while since you visited, your suggestions will still be a great resource for adventure travelers from which to begin their own New Zealand itinerary. Well I found this in perfect timing! I’m visiting New Zealand soon and travelling my campervan so all these tips will definitely come in handy. Cool – enjoy your trip, I’m sure you’ll love it! Good reason to go back one day then! New Zealand is really beautiful . I like you guide. If you don’t have as much time as you guys did you can choose what you want to do from your suggestions. The place looks green and clean. These clear colors! I hope I can visit New Zealand by myself one day! I hope you will make it one day Tatiana! So after traveling for a few years straight we’ve just moved home to Canberra and it’s cheaper for us to fly to NZ than it is to get to Perth on the other side of Aus. So your itinerary couldn’t have come at a better time :D! Will be putting it to good use very soon – thanks!! So…. go to New Zealand then 🙂 I’m sure you’ll love it Meg! Thanks for sharing your itinerary! New Zealand has always been near the top of the list of places we want to go and this just gave me major wanderlust! 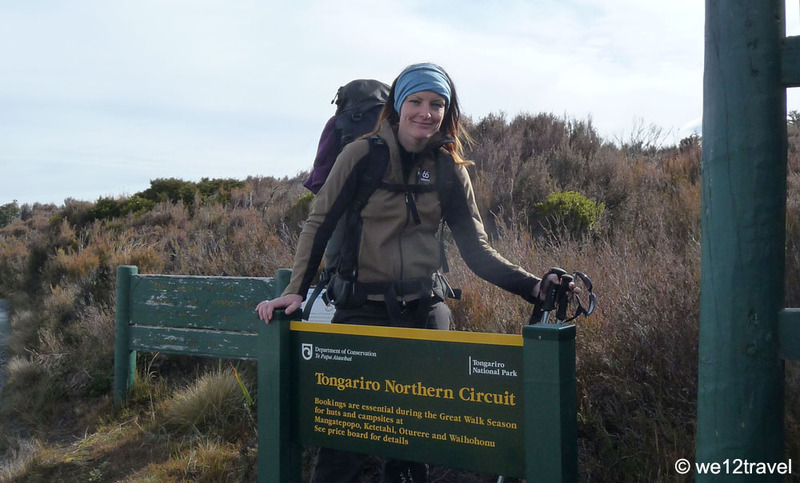 Everything you mentioned looks fantastic, especially Tongariro Northern Circuit–what a gorgeous spot! The SkyWalk looks pretty awesome, too! You’re welcome! The Tongariro Northern Circuit was definitely one of the highlights of our whole New Zealand trip, I’d definitely recommend that as one of the best multi-day hikes in New Zealand! I hope you guys get to go there one day, it’s a great destination and I’m sure you would love it there! Thanks Ron! 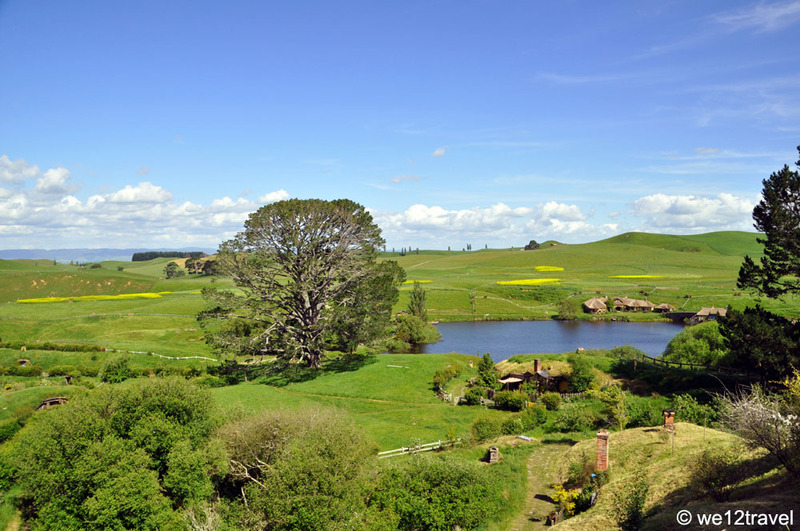 I don’t think you can actually sleep in the Hobbiton houses, it’s on private land and we had to take a tour to get even near them. However, it may have changed, I’d Google it to check. Or maybe as a blogger, they could make an exception for you? It would be a truly unique experience for sure!